We get it. There are many of us with a "fear of commitment". Even if you've been courting an awesome job candidate or are ready to rent to the perfect tenant, sometimes you only want a quick background check instead of committing to a third party background screening company. This is especially true if you know that your awesome job candidate or tenant could be off the market soon. You want to move swiftly. You also want credible data that you can depend on when making a decision on the right people. 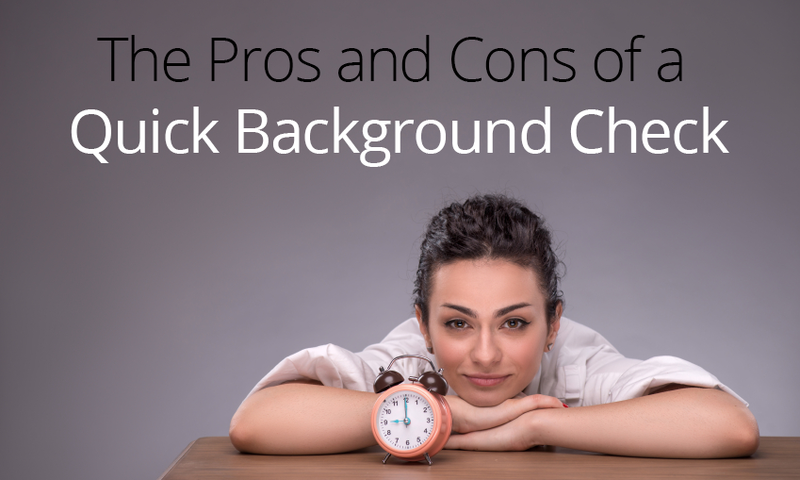 Is a quick background check a good idea? Let's dig deeper. Quick background checks can help expedite the on-boarding process. Database searches offer broad coverage (beyond an applicant’s known address history). Certain instant background checks are very accurate and available by accessing ‘direct to the source’ data (example: Driver License Records, Credit History Reports, etc). They can be misleading if not properly explained by your background check provider. Fast turnaround times can often lead to hasty hiring mistakes and rental decisions. Criminal background database searches are not fool-proof (not all jurisdictions are available through a database query). This is not to say that a thorough background check should take a “long” time. At VeriFirst, we take a tiered approach to the screening process. Instant searches are processed immediately, while those requiring additional research and investigation are handled in an expedited manner - with status updates sent to the hiring / property managers as new information becomes available. We recommend using an instant criminal database search as a supplement to a more thorough (direct from the source) criminal search. As a general rule of thumb, running a County Criminal Courthouse Search will provide the most up-to-date disposition(s) of a candidate’s background. At VeriFirst, we utilize FETCH technology (where available) to access county courthouse data for accurate and expedited courthouse searches. (Typical turnaround time is 1 business day for a County Criminal Courthouse Search). In addition, a business may also wish to conduct a complete statewide criminal record search. The statewide search should include all Counties in the state (at a more affordable cost than running each county individually), but usually carries a longer turnaround time (3 to 5 days on average). We also recommend businesses request a clear outline and understanding of what’s included in their criminal database search. The background check company should be able to furnish a State-by-State listing of criminal record data sources and inclusions. If your company is located in, or hiring / renting to an applicant that has resided in a jurisdiction missing from the database search, adding a County Criminal, Statewide Criminal, or Federal District Court Search is highly recommended. For a complete copy of what’s included in the VeriFirst Criminal Database Record Search, CLICK HERE. Whether you decide to work with a background screening company or run a quick internet background check, we want to make sure that you are well informed. With over a decade in the background screening industry, it is our goal to make sure that hiring managers and property managers have a reliable resource for information about staying compliant and choosing the right people. We know that making the decision to hire or rent to an applicant shouldn't be taken lightly. Let us know if we can help.